The robotic craft, the Kounotori 2, blasted off Jan. 22 at 2:37 p.m. Japan Standard Time (12:37 a.m. EST, 0537 GMT) from the Tanegashima Space Center. 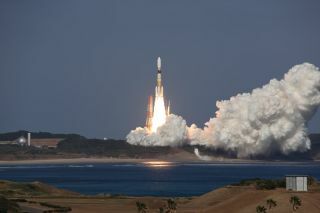 It launched into orbit atop Japan's expendable H-2B rocket. This is the second voyage for Japan's fledgling orbital spacecraft fleet. The first Kounotori cargo ship flew to the space station in September 2009. Kounotori 2 is a gold cylinder about 33 feet (10 meters) long and 14 feet (4.4 m) wide, packed with 5.3 tons of supplies, including fresh food, for the orbiting lab. Some of this cargo will be unloaded inside the station, while other, larger pieces of spare hardware will be temporarily installed on the lab's exterior. NASA plans to broadcast the operation live on NASA TV. Japan's Kounotori freighters, officially known as H-2 Transfer Vehicles (HTVs), are part of a growing suite of internationally built unmanned cargo spaceships that help supply the International Space Station. After NASA's astronaut-carrying space shuttles retire this year, the robotic ships will play a vital role in stocking up the outpost for its live-in crews. After about two months at the space station, Kounotori 2 will be filled with trash and sent back toward Earth, to be destroyed by the heat of re-entry.